Browne’s Folly is an Avon Wildlife Trust reserve just outside the village of Bathford. Apart from the folly itself (bryologically uninteresting) it is best known for its extensive honeycomb of oolitic limestone mines which are home to an important population of the rare Greater Horseshoe Bat. On a gloriously sunny spring day, eleven bryologists turned up to help survey the site, which was last properly looked at in 2003. We took a path that followed the lower contours of the hill, through mature ash woodland. At first common species prevailed but things became more exciting as we entered a former quarry, with magnificent limestone cliffs and large boulders calved onto the woodland floor. The slopes were steep and there was much hilarious slipping about after heavy rain the day before. On and around the exposures were Seligeria pusilla, Eucladium verticillatum and Leiocolea turbinata. A small patch of Tortella inflexa, a scarce and rather subtle species, was found but did not impress many people. Several of us came across a large and beautiful patch of Porella arboris-vitae; several people had never seen this rather western species before and had fun with its distinctive peppery taste. A nearby jumble of large deeply shaded sloping rocks, were home to a considerable amount of fertile Hygrohypnum luridum, which, as usual in this region, was nowhere near a watercourse. A dingy acrocarp growing nearby generated avid discussion but later turned out to be Didymodon vinealis. Then we emerged from woodland into bright sunshine, in a large former quarry below the folly. It is kept clear of trees and scrub by the trust and on the day we visited was very popular with families having picnics. This area supported more species, including Weissia controversa var. 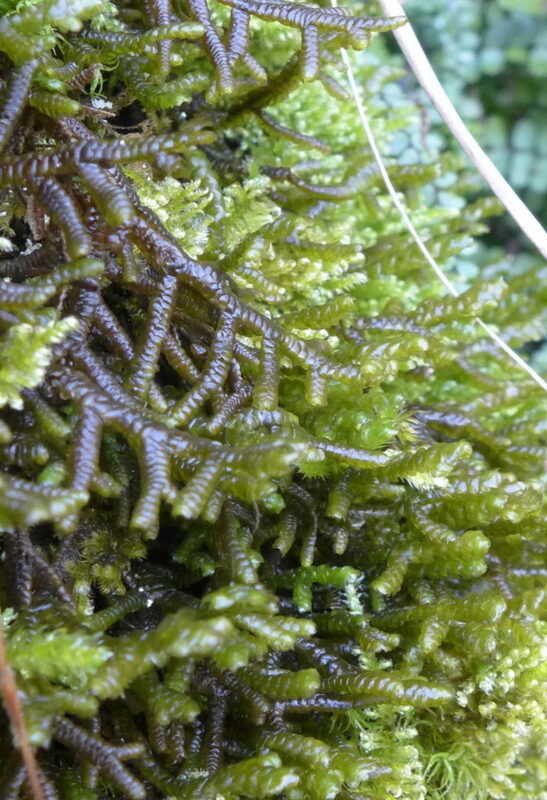 crispata, with its broad red nerve, Encalypta vulgaris, Hylocomium splendens and Scapania aspera. Tortella nitida, a scarce saxicole in this area, was present on various rocks and a nice red patch of Nowellia curvifolia was found on a pile of damp, decomposing logs at the woodland edge. To the bemusement of the families picnicking nearby, we searched hard for Entodon concinnus, finally finding a good-sized patch growing in the shortest turf with a scruffy-looking Thuidium which turned out to be the uncommon T. assimile. On the way back an oak tree produced some more epiphytes, including Orthotrichum striatum, with its sharp leaves, entirely smooth capsules and sixteen peristome teeth.